You know how we love our coffee with a bit of drama, and if you are like us, you'd enjoy a quiet afternoon of a cuppa and books at Explore The You. When you step into Explore The You in Sainikpuri, the first thing you'll notice is the woody ambience. Find yourself surrounded by paintings on the walls (Which are for sale), lights dangling from the ceiling, and a lofty shelf full of books. 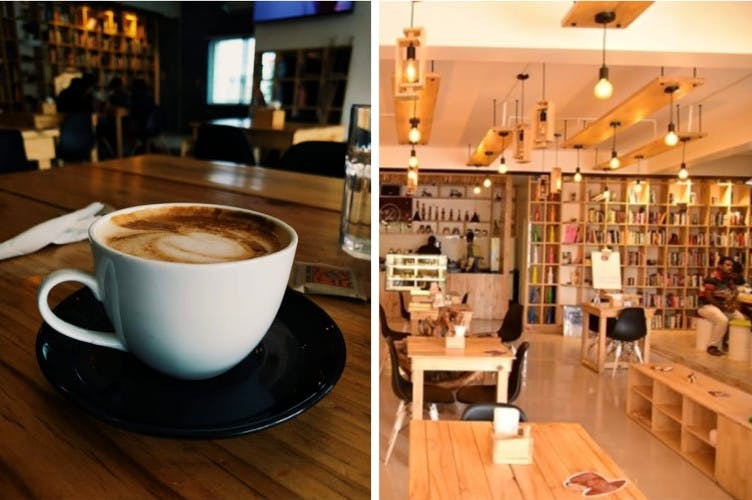 Considered as a cafe that is full of abandon you'll find hipsters playing guitar, families chattering over burgers, and artists musing in one corner over coffee. But for the most part, it's a popular hangout for students.We tried the Butter Coffee, hazelnut cappuccino, and a chicken burger. The burger arrived in no time and was accompanied with spicy potato wedges and mayonnaise. The chicken was crisp and tangy — cheers to it! While the cappuccino was tasty, the Butter Coffee was a little too greasy for our taste.